In an ongoing quest to challenge myself with longer races with ever-increasing elevation gain, I figured running a half marathon with “Inferno” in its name would be a good milestone. 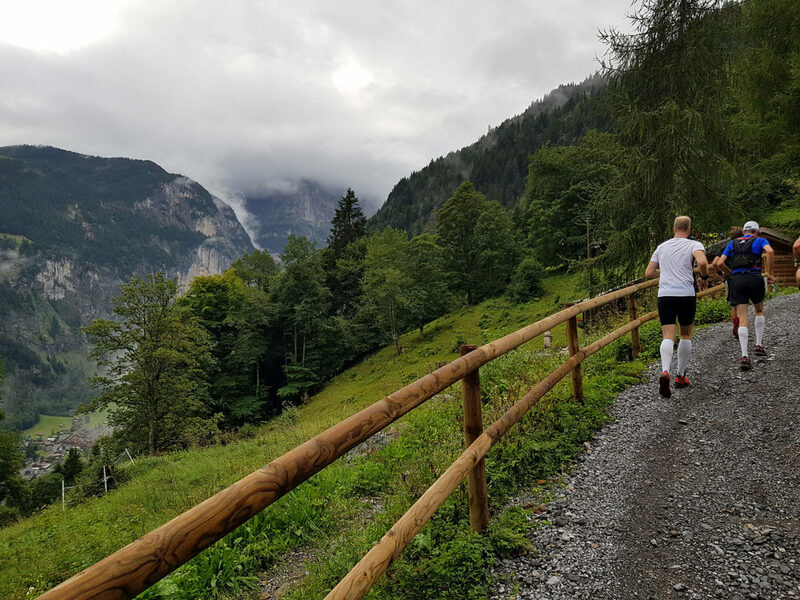 So in August, the wife and I set off for Lauterbrunnen in Switzerland, the location of this iconic half marathon that climbs from valley floor (795m) to Alpine mountain peak (2970m). A bad weather front hit Lauterbrunnen the night before the race. A thunderstorm passed through the valley, there were torrential rain showers and I was quite concerned about racing in these conditions the next morning. When the gun went off at 10:15 on race day, things had calmed down somewhat. It was still drizzling, but the rain was forecast to stop in the following hour. More importantly, there was no snow or ice reported up high. I positioned myself conservatively in the line-up, then on the first meters made my way to the right border of the road so the wife could snap a picture. 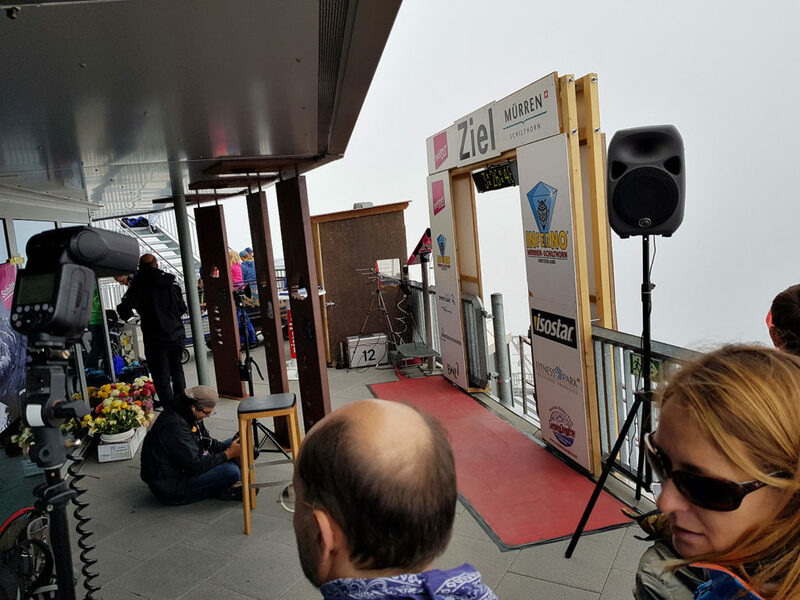 Due to the weather and logistics involved, she would spend the day on the hotel balcony rather than fight the crowds on the way up to Schilthorn to maybe get a second glimpse of me. 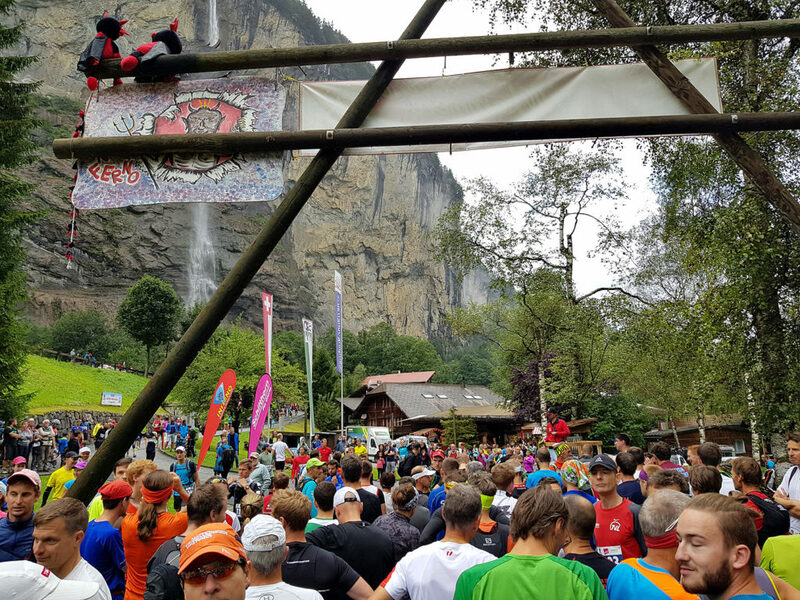 After the gun went off, we left the campground that houses the starting line and ran through Lauterbrunnen on the paved main street. After less than a kilometer we turned onto a side road. 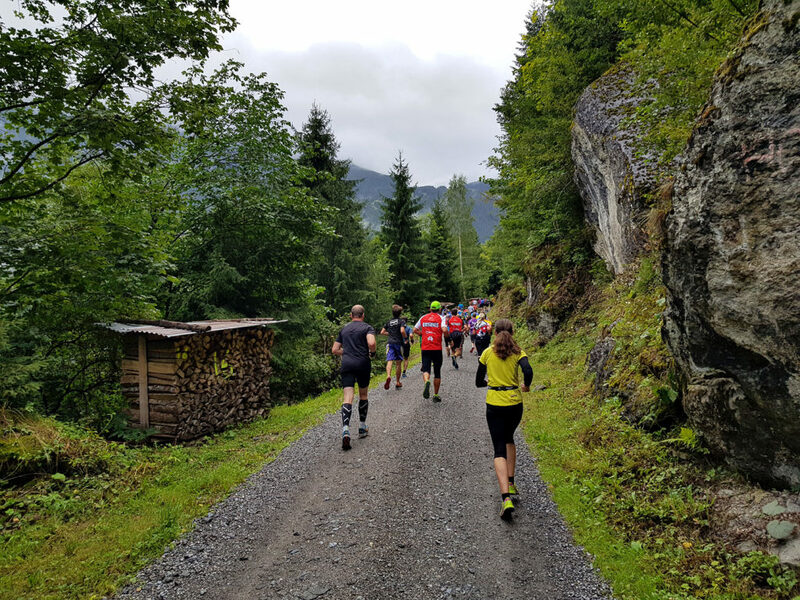 The next 5km of the race were still fairly easy – a nice and even climb on a paved side street which then turned into a gravel road. I managed 3.3km of uninterrupted running before I first reverted to intermittent power hiking. 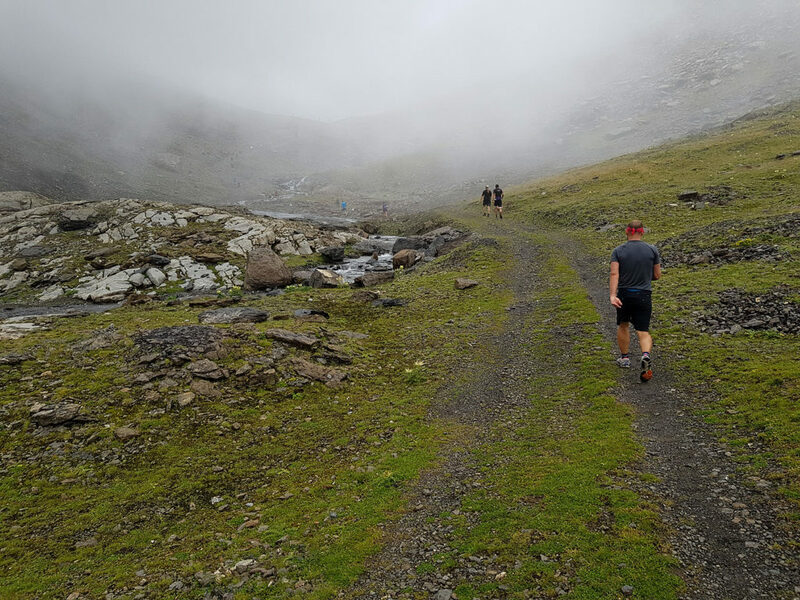 While the surface was easy enough, we were still climbing 500m of elevation during this 5km stretch, for an average grade of around 10%. 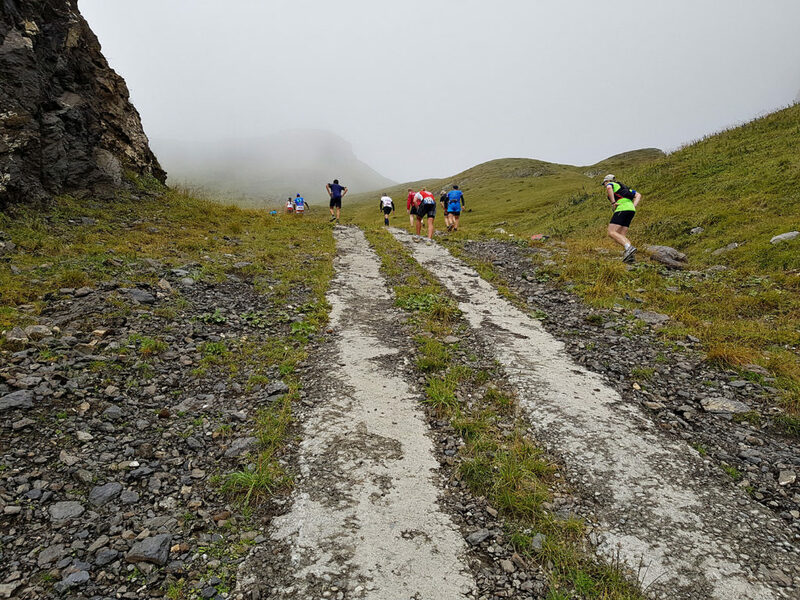 The 6th kilometer was steeper, with an elevation gain of 172m. The surface also changed, from gravel to grassy mountain path with some mud. 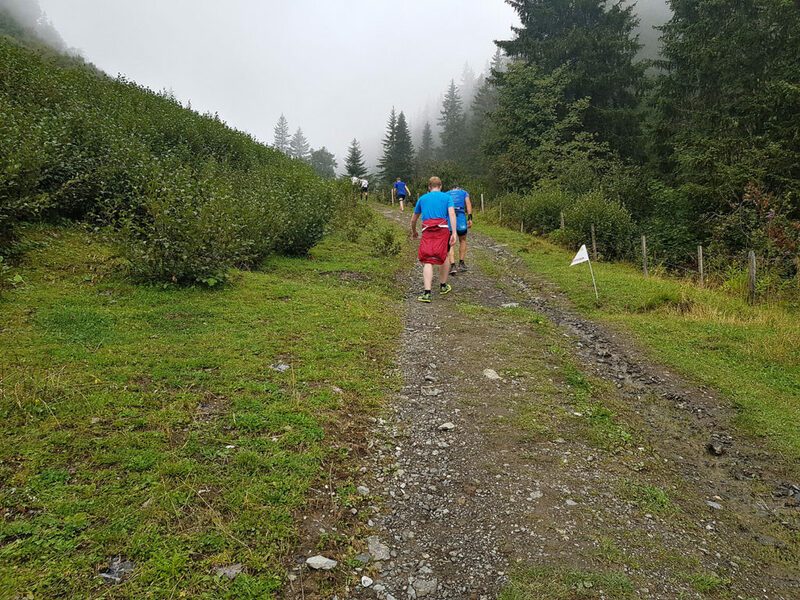 We reached Grütschalp, climbed a little more, and then rejoined a gravel road. For the next few kilometers, the grade would be more moderate. The views opened up, and allowed glimpses down into the valley. 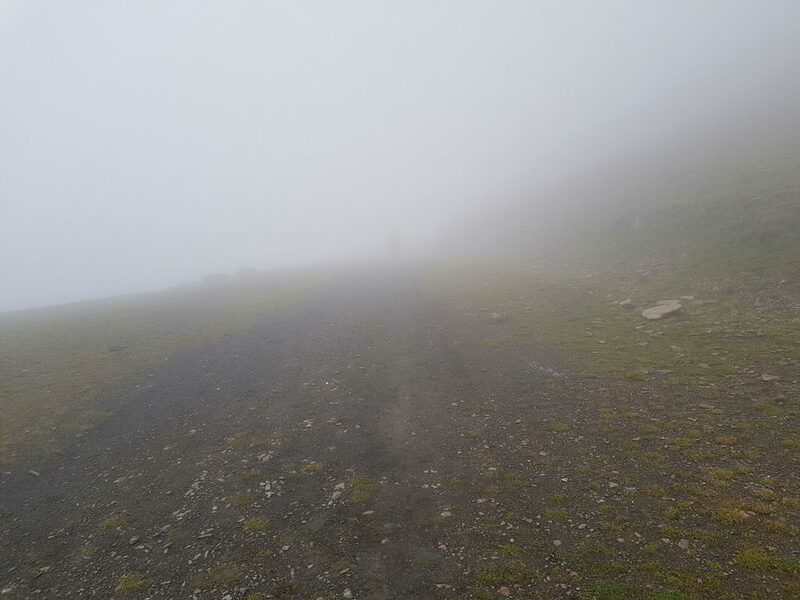 Unfortunately, all the surrounding mountains were still shrouded in clouds. But at least it had stopped raining, as predicted. 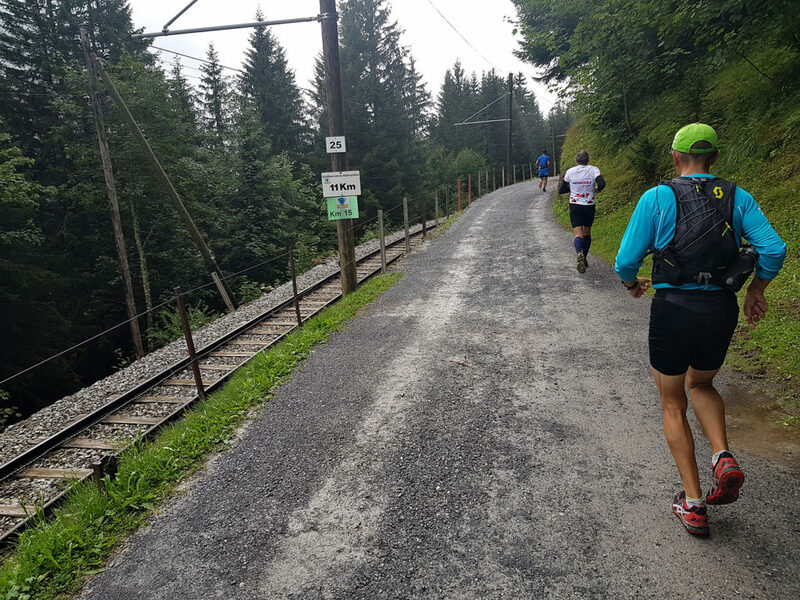 The next kilometers were on easy gravel, and basically ran parallel to the train tracks going up to Mürren. I was able to resume running at a decent pace; averaging slightly over, then slightly under 6:00min/km. 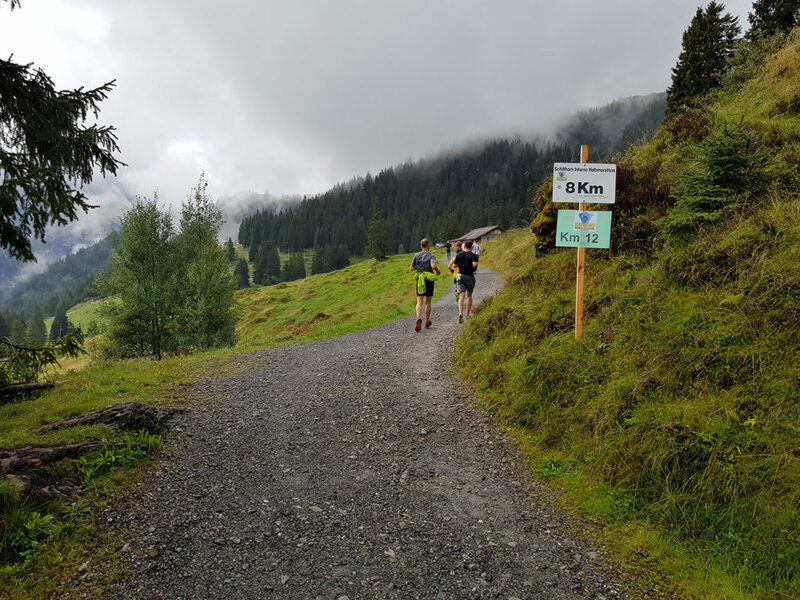 I managed to keep this pace until kilometer 12, when we reached Mürren. As we crossed through this small mountain town (that is car-free), the surface changed back to paved. Tourists were encouraging runners, but I guess the bad weather somewhat influenced the number of people who were out and about. 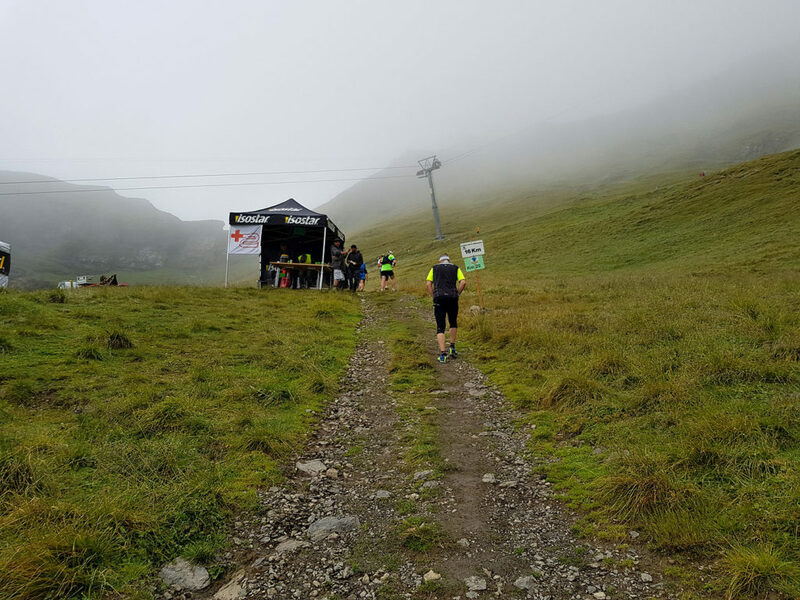 At kilometer 13, on the outskirts of Mürren there was an aid station where I refilled my water bottles. 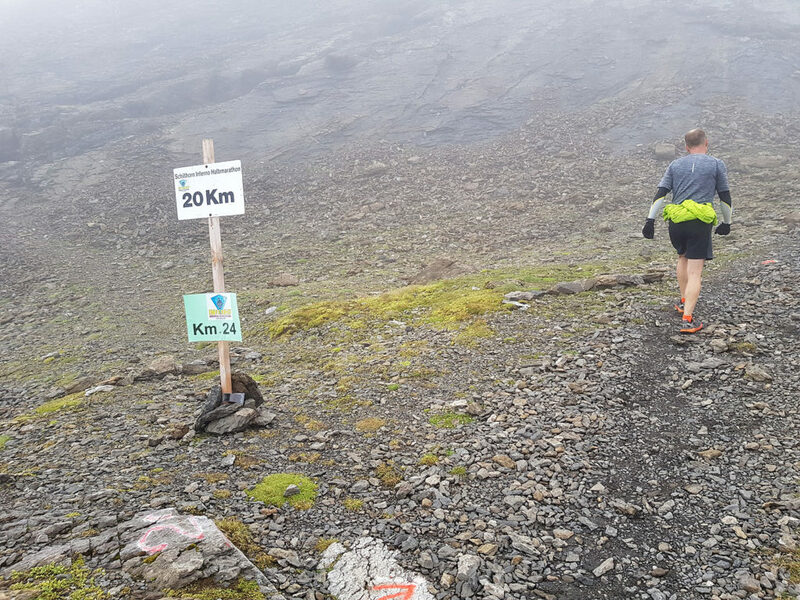 There were only 8 kilometers left and I was still feeling quite good. However, most of the climbing was still ahead of me. The official race website mentions that the first half of the race is “fairly harmless” and merely a “warm-up”. 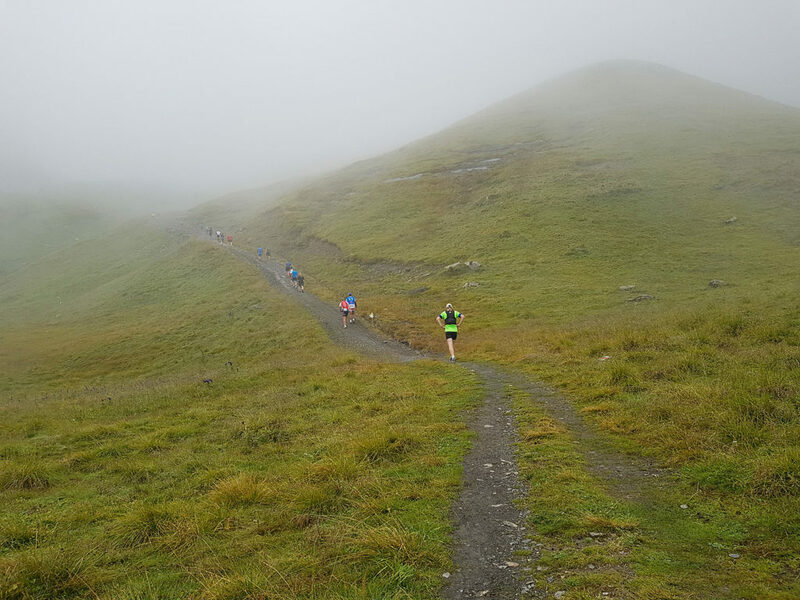 I had covered 800m of elevation, so 1300m were still ahead. From here on out, we would be on hiking trails only. There was going to be a succession of relentless climbs, all of which reduced me to a power walk. 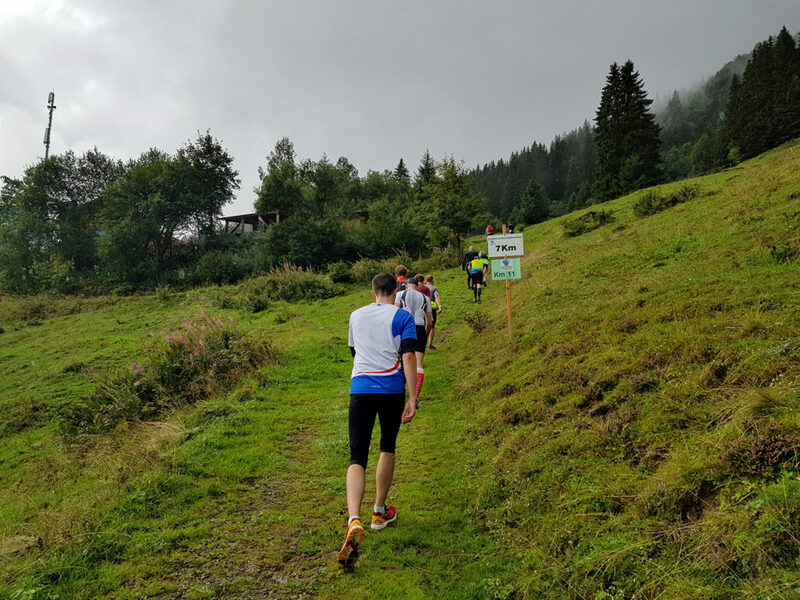 The first one was Höhenlücke, a somewhat muddy climb where I instantly went from feeling pretty good to wondering why I had signed up for this race. 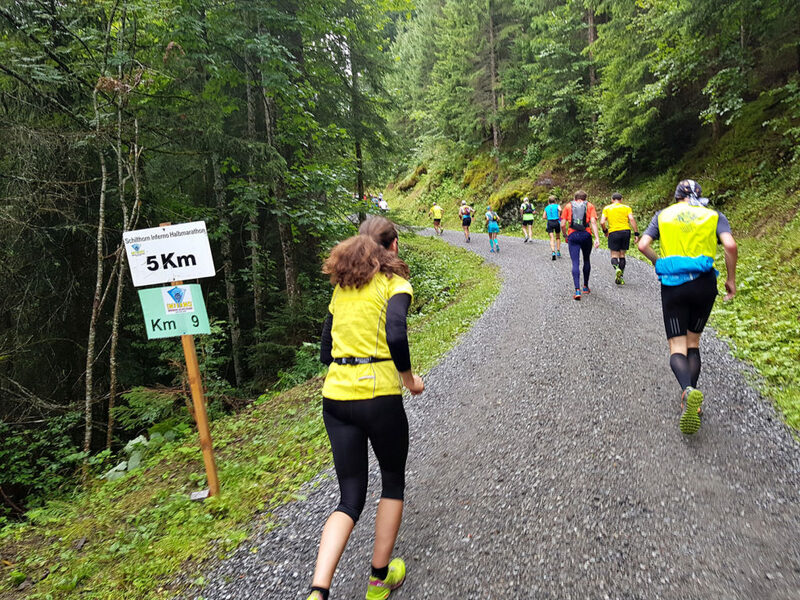 At Kilometer 15 came the next aid station, and then came the second big climb, Kanonenrohr. 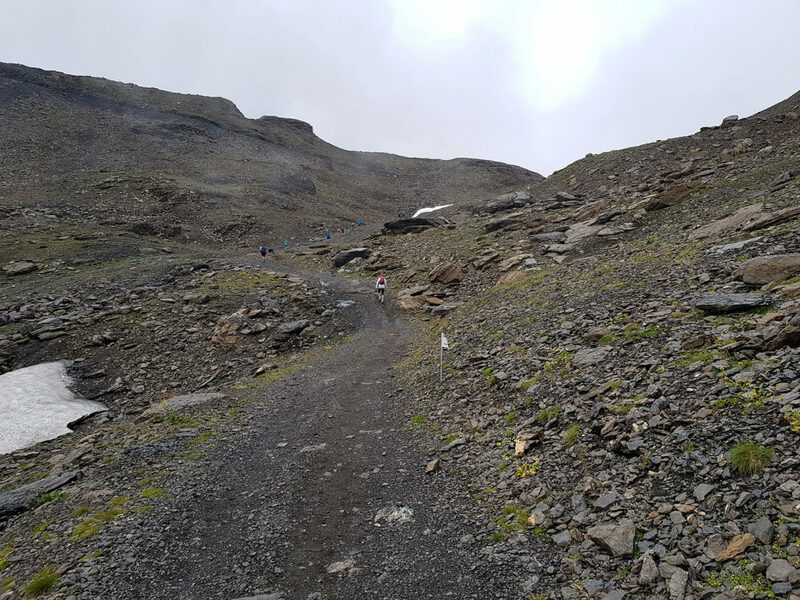 The trail surface changed for the better – gravel and rocks replaced the mud – but in turn the grade worsened. One short stretch in particular was so steep that a few people opted to contour around it rather than subject their calves to that extreme of a push. 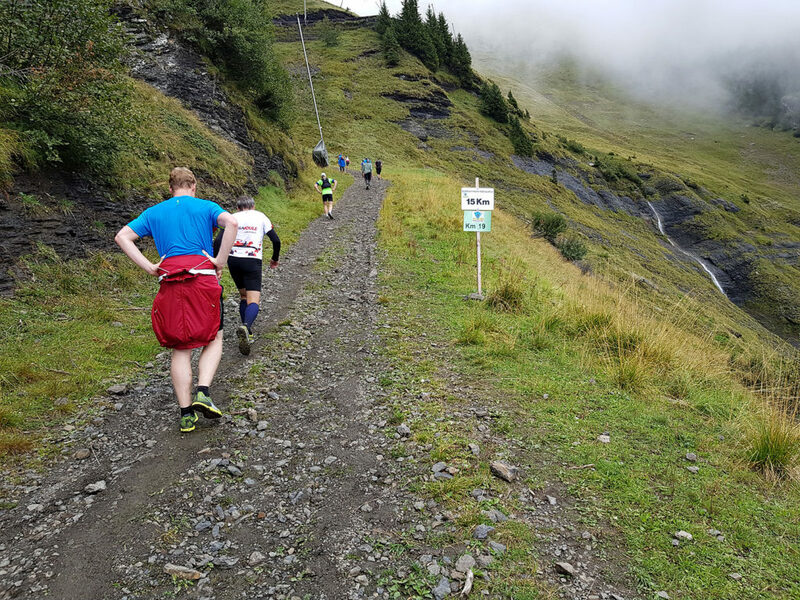 Kilometer 16 was the steepest part of the course so far, and climbed 241m. There was another water station here. The trail continued to be quite steep, and a few muddy patches appeared. Kilometer 18 had the only (very minor) downhill of the race, as we passed through Engetal. I was even able to resume running for a bit. 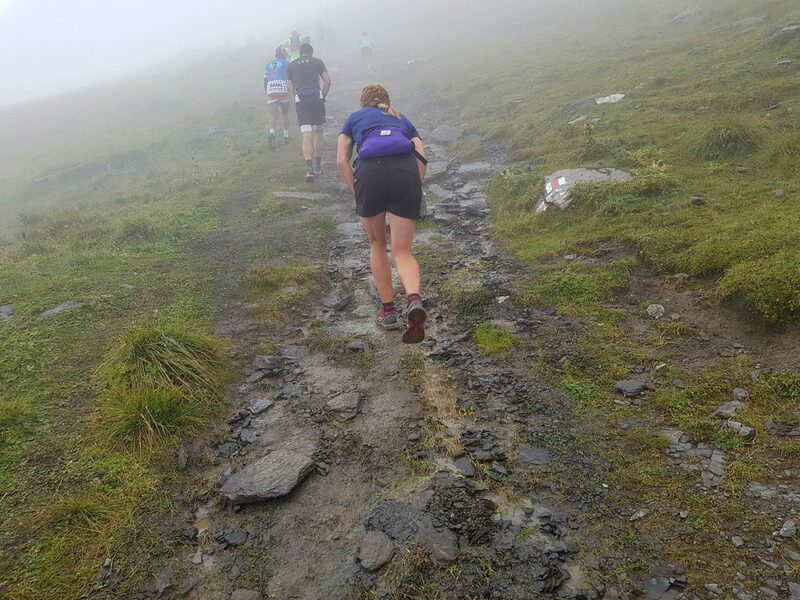 And then, on the next climb my body let me know that it had enough. 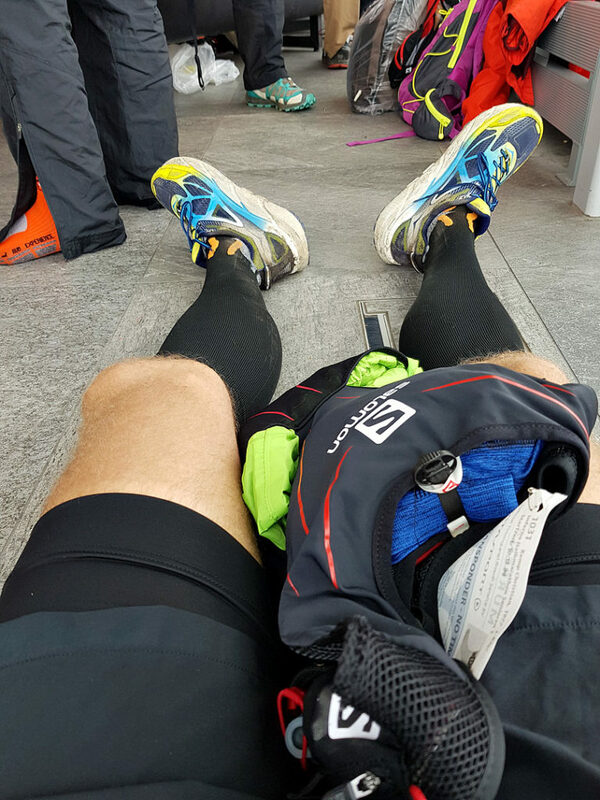 My quadriceps (or rather my vastus medialis, I think – not a doctor) muscles on both legs were cramping up. Even just walking became painful, and no matter what I did (stretch, massage) didn’t really improve things. So I moved forward quite slowly and gingerly, while I was getting passed by around ten to twenty people. A few asked if I was OK and I replied in the affirmative, “only some cramps”. The surface changed to scree, and there was some water to cross. 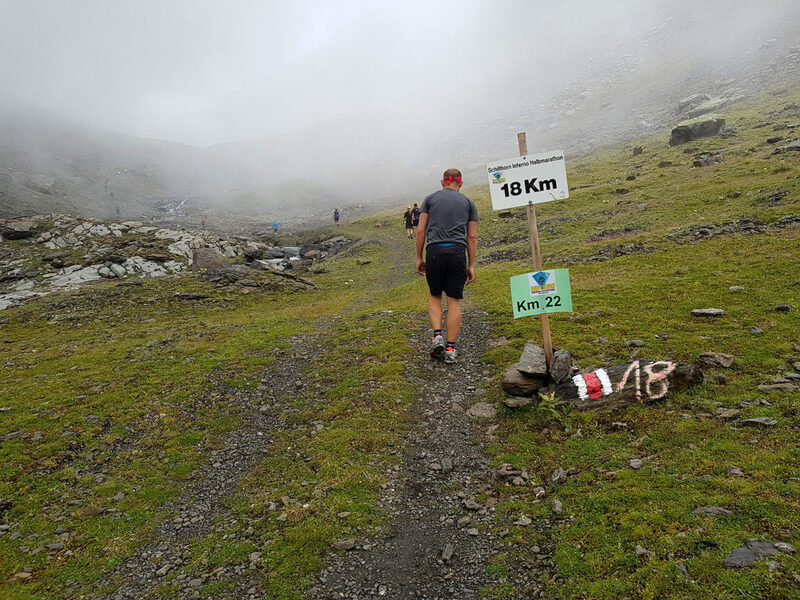 I continued my slow climb, and by the time we reached Kilometer 19, there was another short section that was less steep. This allowed my legs to recover a little. 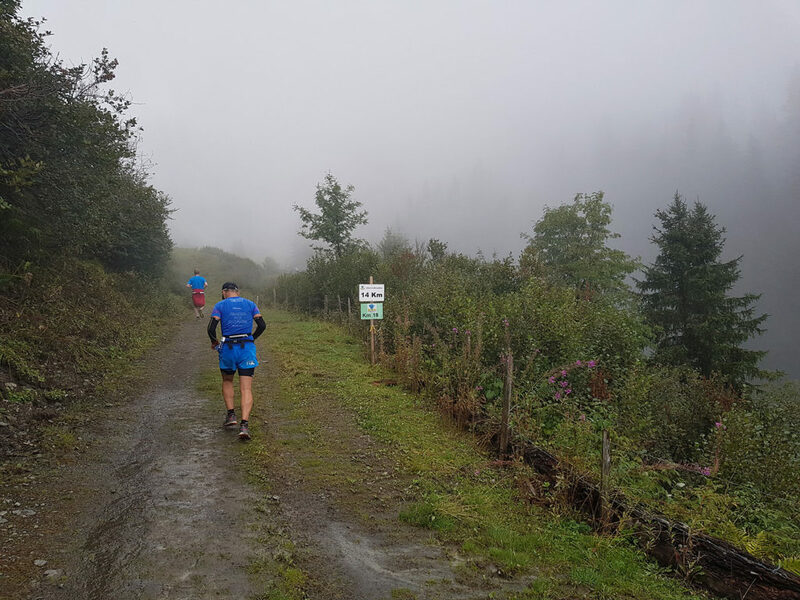 We were now fully engulfed in clouds, so that neither the finish line or any of the surrounding mountains were visible. 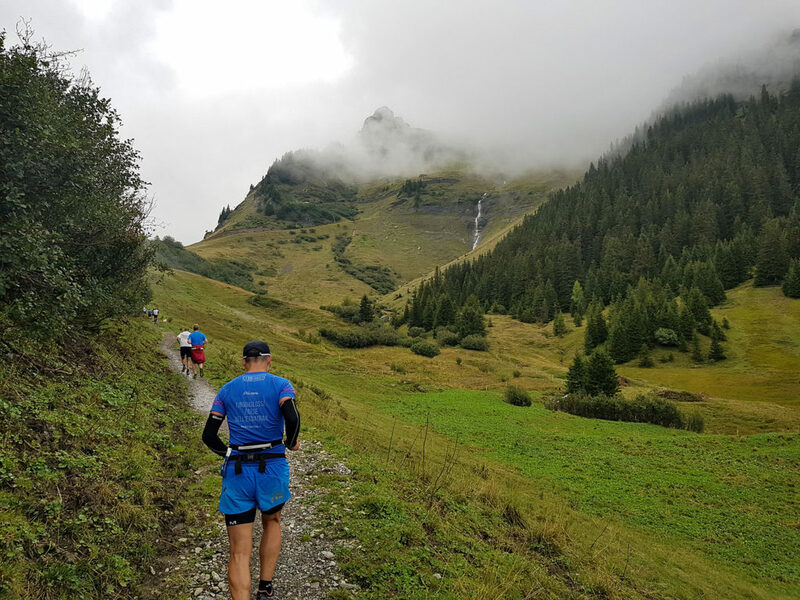 I had managed to find the pace that would allow me to move forward without getting more cramps. Unfortunately, that pace wasn’t very fast. 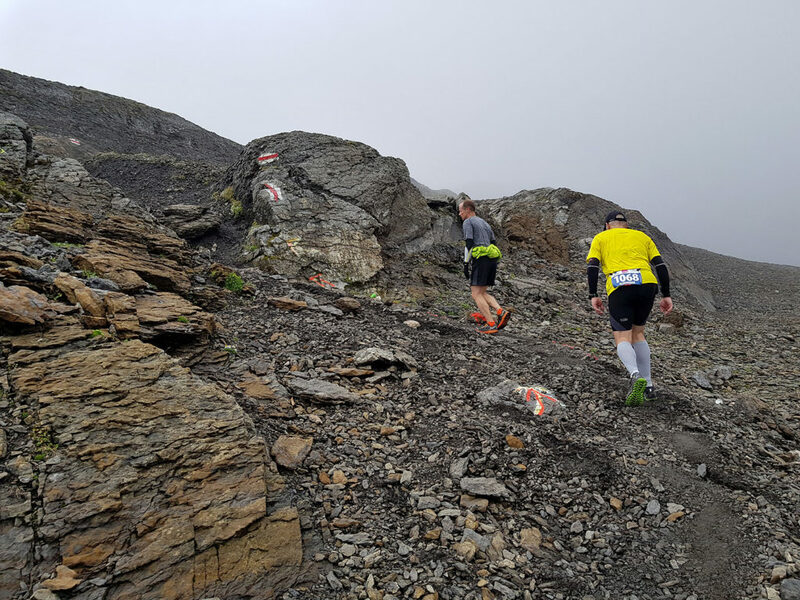 Furthermore, Kilometer 20 was the second-steepest of the race, and climbed a whopping 229m over some more scree and rocks. 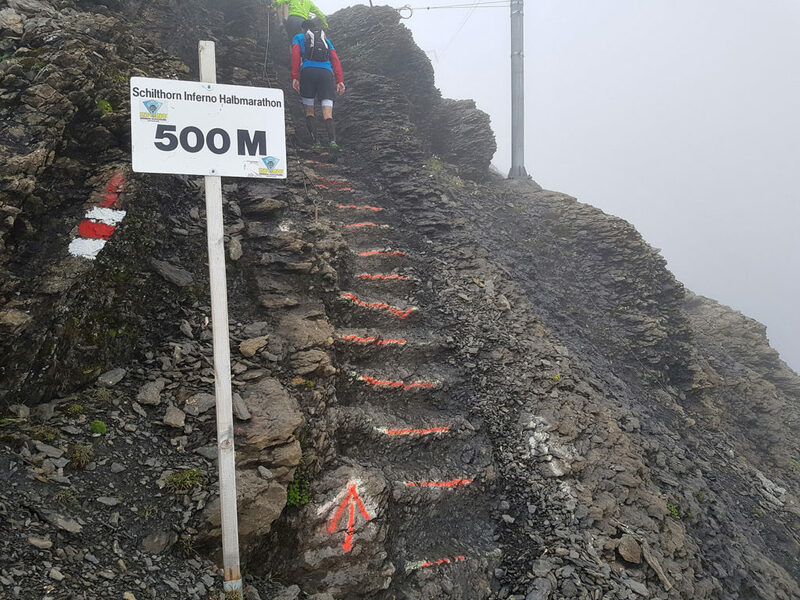 Finally, a most welcome sign appeared: “500M”. Just half a kilometer left. But again, things were very steep, so progress was slow. 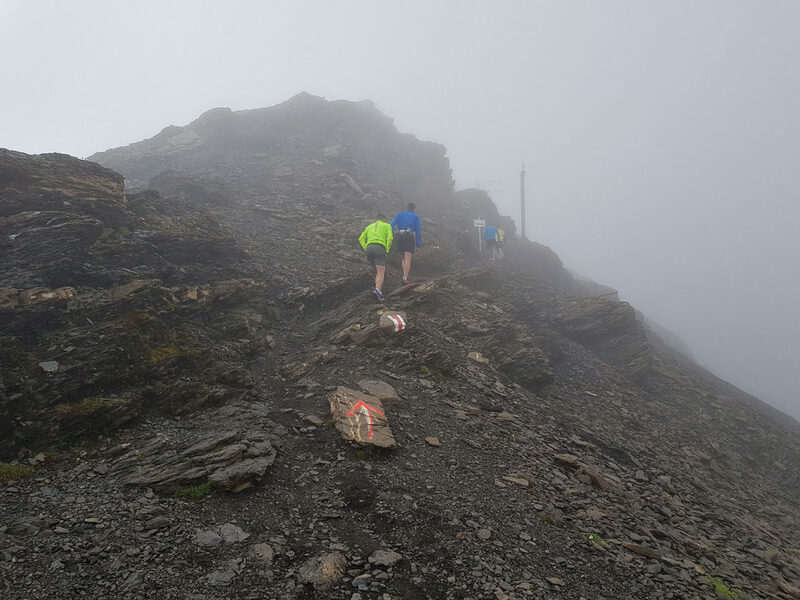 Then, us runners had to cross a knife-edge ridge (which had been protected with steel cables left and right) before making it up the final steep climb and ascending the final few steps to the finish line. My watch recorded a whopping 113m on the final 300m of distance, which translates to a sustained grade of over 30%. I reached the finish line after 3 hours and 25 minutes. I was the 227th male to cross the finish line. An additional 37 women were also faster. There were 486 finishers overall, so that put me at 54%, or somewhere near the start of the slower half. Since many people had arrived before me, the cable car station at the top of Schilthorn was already packed. Fortunately, I still managed to find a small corner to sit down in. 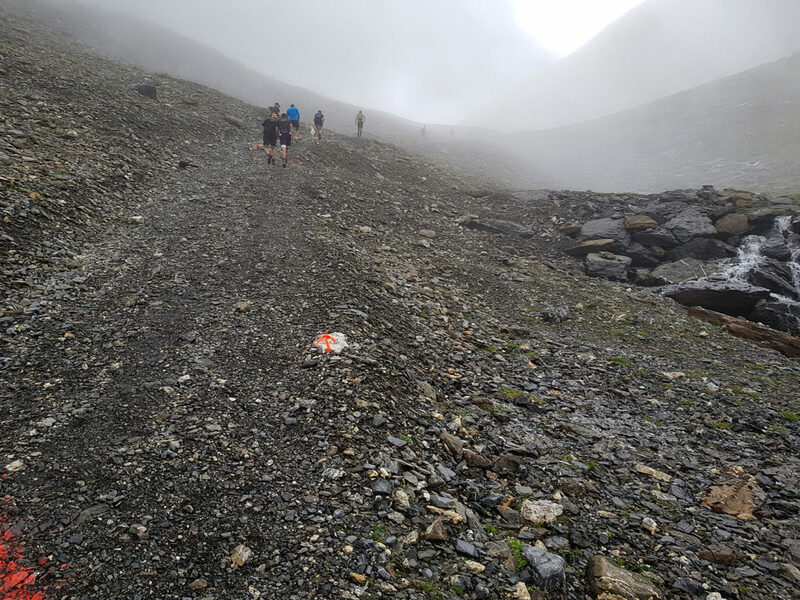 It took me a while to recover, which meant that by the time I felt fully recovered, pretty much everyone had arrived and was ready to descent. Which was a bit of an ordeal. First, I stood in line for one cable car. Finally, I made it into one, but if you are among the first to enter you get out last. So when we walked towards the second cable car, that one filled up before my turn came. So there was some more waiting. 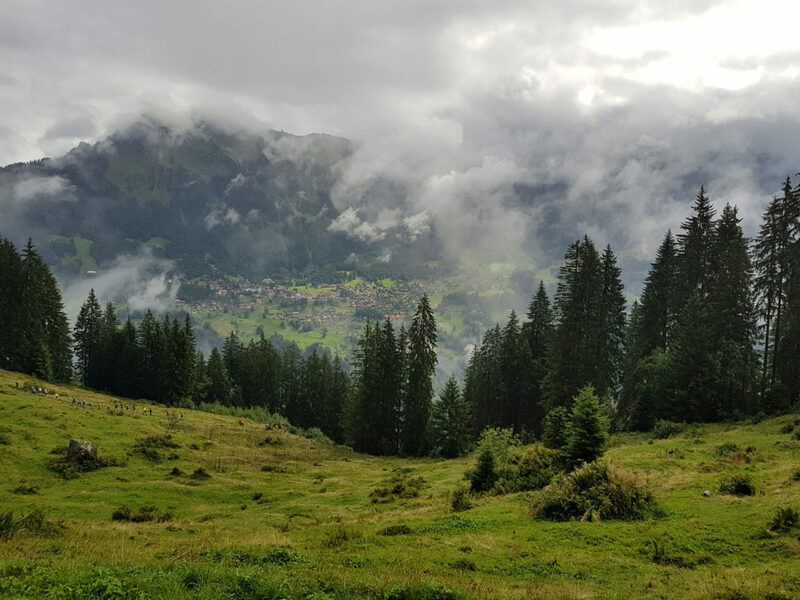 Eventually, I made it down, and walked through all of Mürren to catch the train… to another cable car. At least that one was slightly less packed. 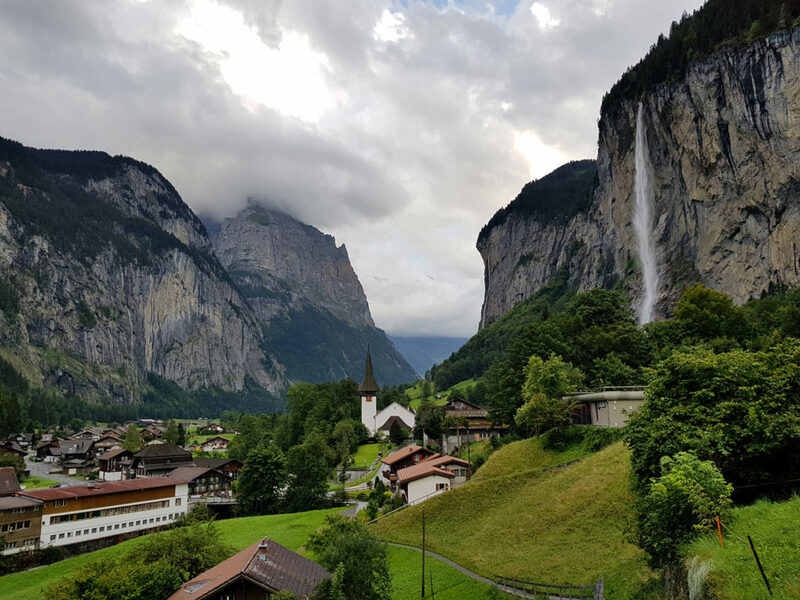 After finally arriving in Lauterbrunnen, I then walked across town to our hotel. 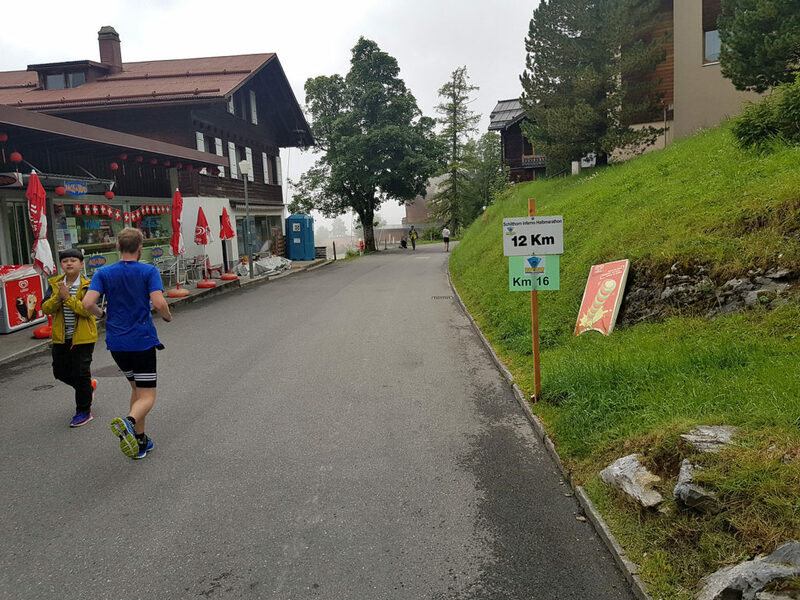 If I hadn’t expended so much energy to race to the top, it might actually have been faster to run down, rather than fight 500 finishers, their supporters as well as masses of predominantly Asian tourists who seemed confused by the ruckus. 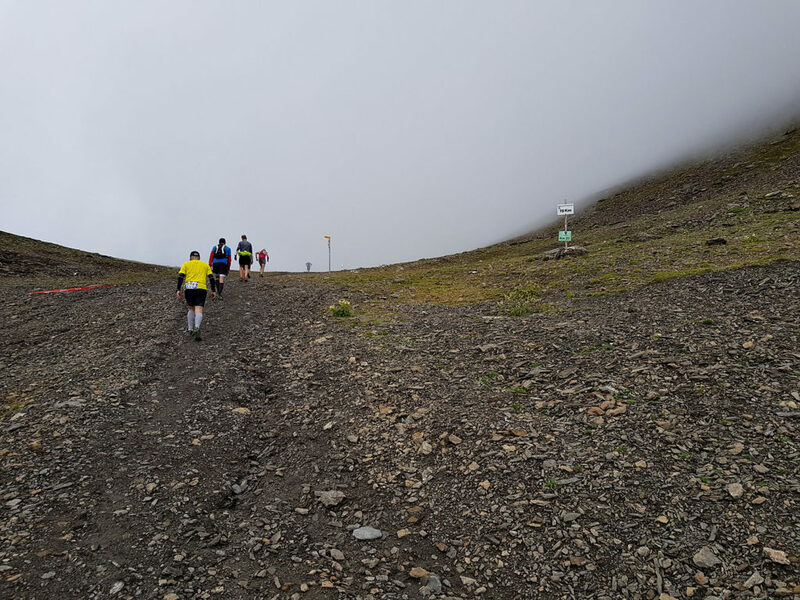 They’d come to see the Piz Gloria revolving restaurant made famous in the James Bond movie “On Her Majesty’s Secret Service”, and all they got was clouds and sweaty runners. 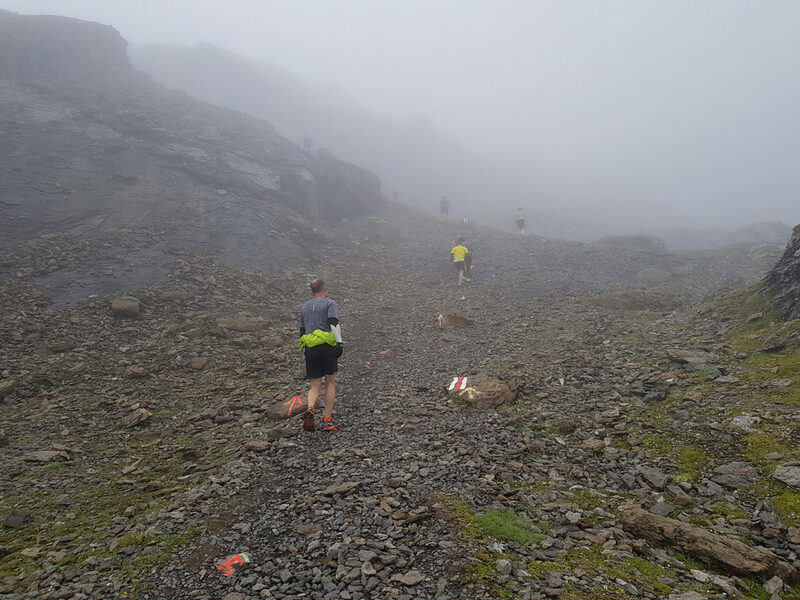 Apart from the long time it took me to get off the mountain, I don’t have any complaints about this race. 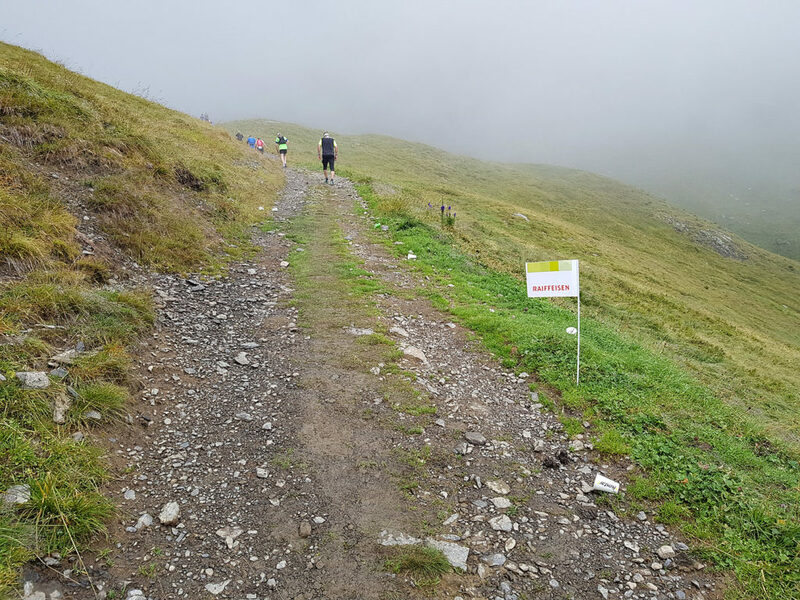 It was challenging, on a well-marked course, and there were plenty of aid stations. However, Lauterbrunnen (and Switzerland in general) feels even more expensive than Chamonix, so it’s definitely not a budget holiday. Will I be back? The race experience would have been very different if most of the race hadn’t been in poor visibility. So that alone would be a reason to return. Also, I’m not overly happy with how I handled the steep second part of the race. I would have needed longer and steeper training runs to prepare my body for that, and in 2017 I didn’t do enough of those. So basically, yes, I would like to go come back and give this race another shot. that sounds tough. 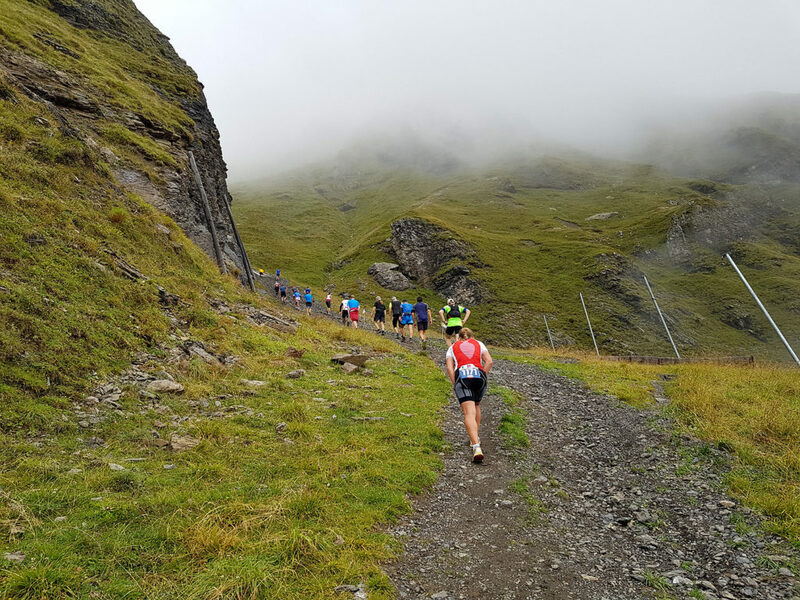 I’m thinking of doing this event year, but I’m not sure I have the experience for the terrain and altitude. 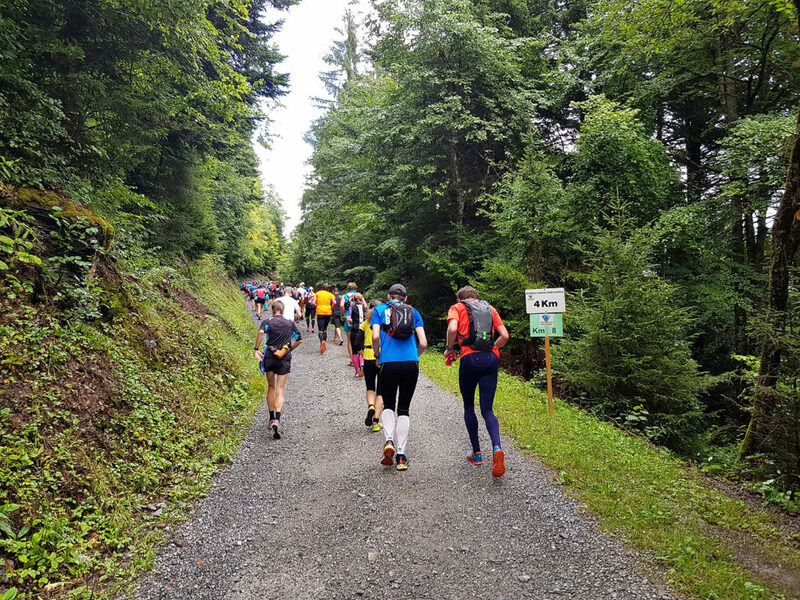 I’m a regular runner but have done almost all road events. I’ve done a few offroad events that involved some uphill but I don’t think they would prepare me for this event. Would you recommend it? 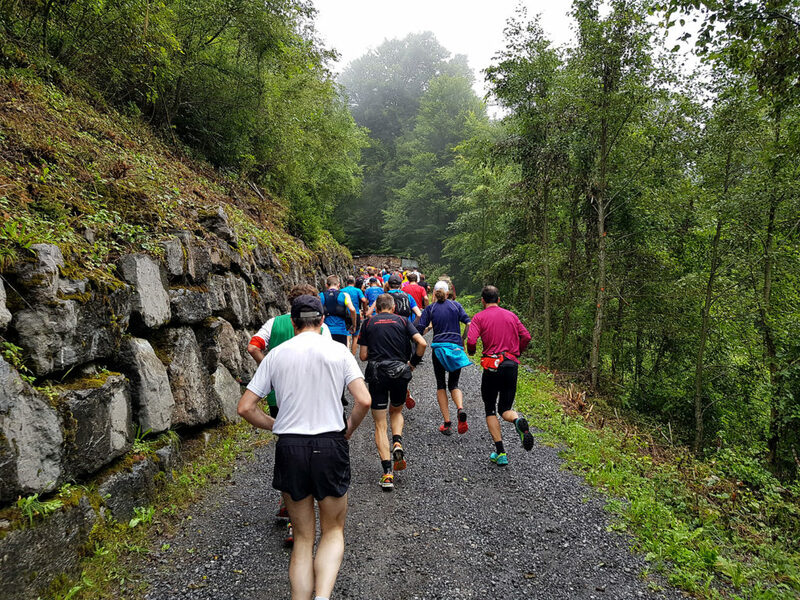 I went into the race having done both the Chamonix vertical km (1000m elevation gain) as well as the 23k (+1600) that took me a similar amount of time than the Inferno would. If you’ve never done >1000m or you’ve never been on your feet for 3+ hours; you probably won’t enjoy the Inferno much. 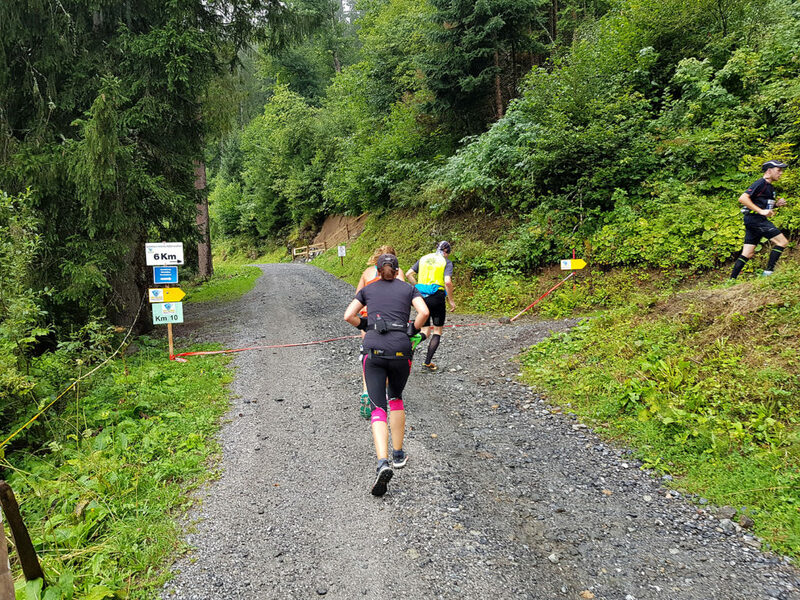 But it all depends on your goals; whether you just want to finish even if it means a slow walk the last 5km, or if you want to put in a decent effort. Ultimately, I basically did the “slow walk to the finish” because my preparation wasn’t quite enough. 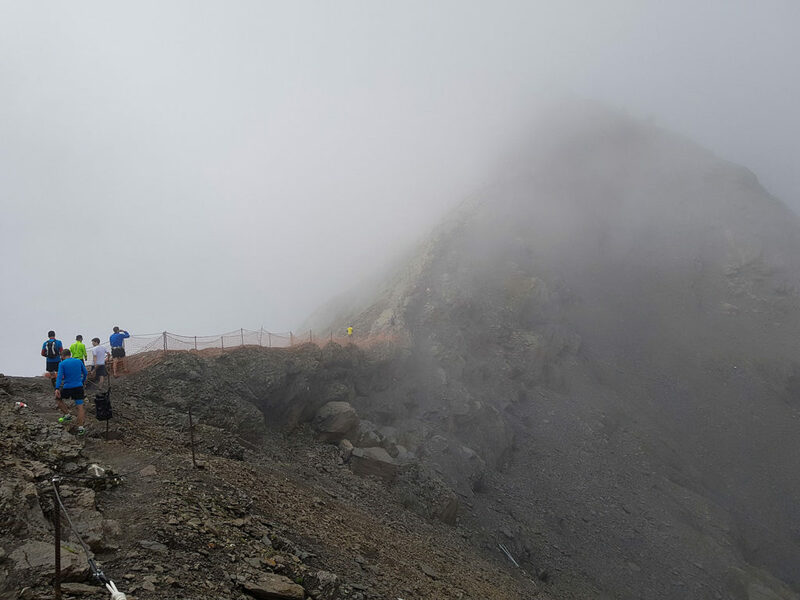 From a technical point of view, while the upper part of the Inferno is obviously not on paved paths, it does not require any climbing. There’s no spots where you need to use your hands, or where you could slip and fall a long way. There’s also no downhill aspect to worry about. 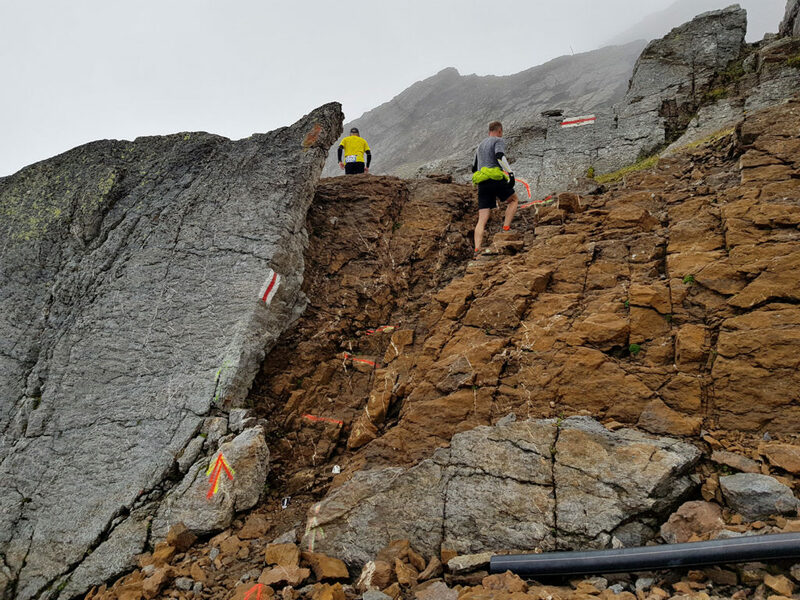 So basically, the difficulty comes from the prolonged uphill, and less from the difficulty of the terrain. 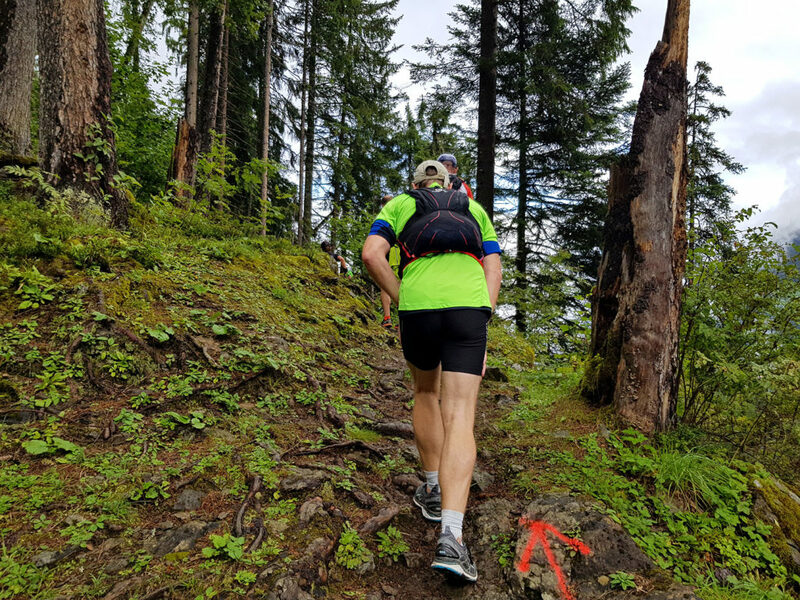 My advice would be to either find a test race in the next few weeks that has at least 800-1000m or more of elevation gain over the shortest possible distance (there’s plenty in the Alps); or if that’s not possible do a training run on a 200-250m hill where you try to cover it 4 times in a row. If you manage either; the odds are fairly good for the Inferno even though it’s longer. 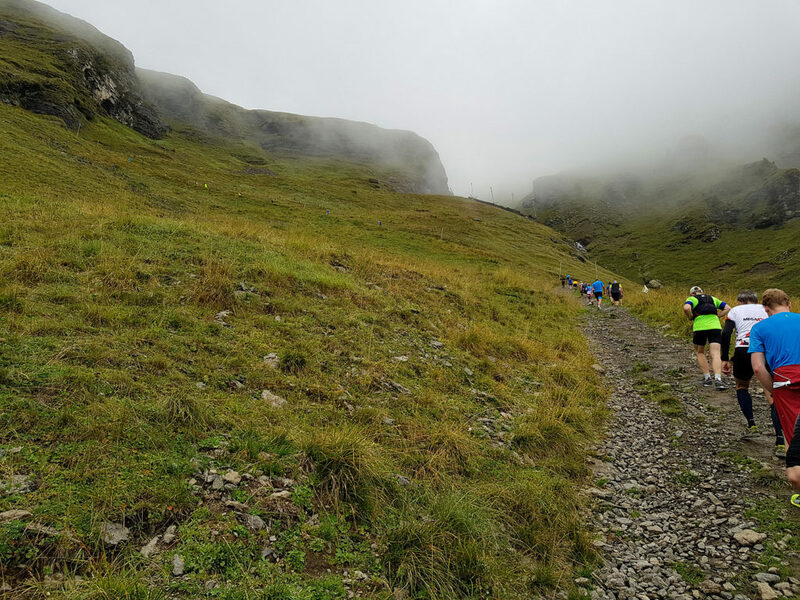 Not sure what your age or mountain experience is, but most people won’t encounter any altitude symptoms; since you start at 1000m and only spend time at higher elevations fairly briefly. 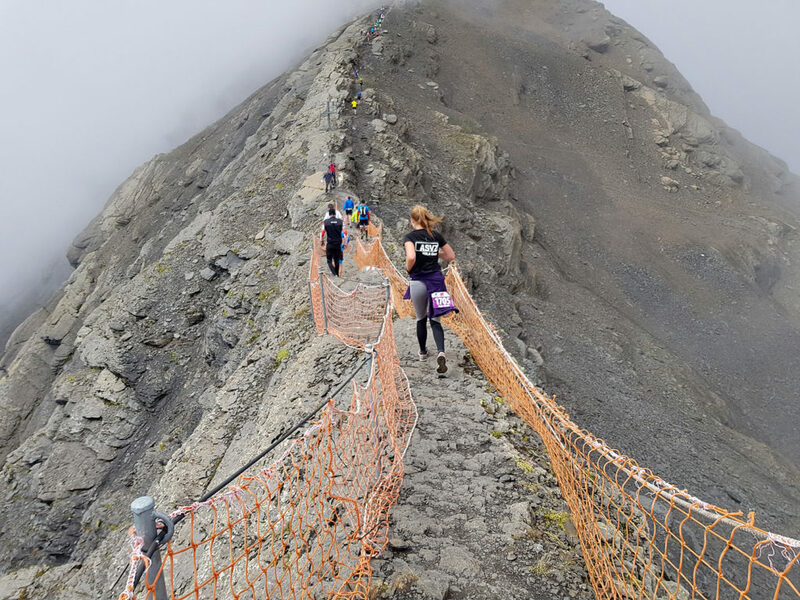 But if that’s a concern, if you’ve previously been able to visit a 2500-3000m peak and have been able to move about without difficulty (breathing / heart rate); you should be fine. But if in doubt, consult a doctor. If you think you’re up to it, definitely go. It’s good to have challenging goals in your life. 🙂 I might be participating again this year; but haven’t made a firm decision yet.